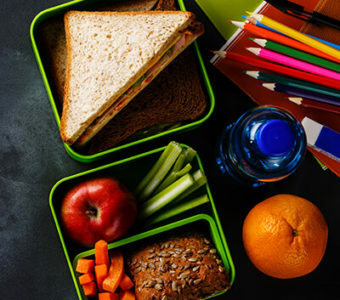 We round up healthy lunch ideas for kids — that they’ll actually want to eat! Low-fat Greek yogurt replaces some of the mayo for a healthier take on chicken salad. Throw into a pita for an easy-to-eat sandwich for the kids. 2. 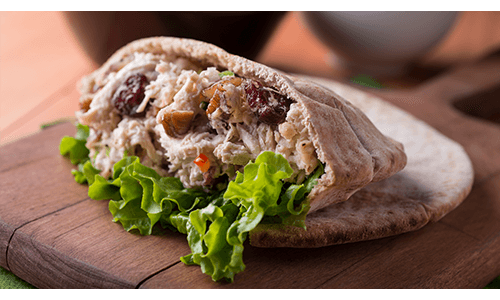 Wrap each chicken breast half completely and tightly in heavy-duty plastic wrap. Add the chicken to boiling water. Cover and simmer for 20 minutes or until a thermometer registers 165 F. Remove from pan, and let stand for 5 minutes. Unwrap chicken and shred; refrigerate for 30 minutes or until cold. 3. Combine mayonnaise and the next 7 ingredients (through black pepper) in a large bowl, stirring with a whisk until combined. Add chicken, celery, cranberries and almonds; toss well to coat. Cover and refrigerate for 1 hour. Serve over salad greens. Serves: 6. Calories: 339. Fat: 13.6 grams. Saturated fat: 1.9 gram. Protein: 39.5 grams. Carbohydrates: 14.6 grams. Fiber: 2.8 grams. Cholesterol: 95 milligrams. Sodium: 525 milligrams. Bring brunch to the school cafeteria with this sandwich! 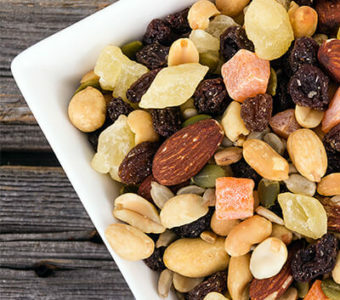 This cross between breakfast and lunch is a great way to provide kids whole grains, dairy and protein for a full day ahead. 1. Combine first 3 ingredients in a small bowl. 2. Spread mayonnaise mixture evenly over 1 side of each waffle. 3. 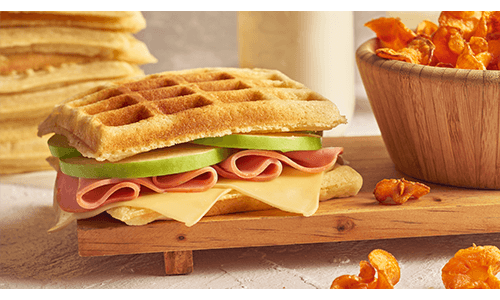 Layer 1 cheese slice, 1 lettuce leaf, and 2 ounces turkey on each of 4 waffles; top with remaining 4 waffles. Serves: 4. Calories: 363. Fat: 16 grams. Saturated fat: 3.8 grams. Protein: 21.3 grams. Carbohydrates: 33.2 grams. Fiber: 3.3 grams. Cholesterol: 36 milligrams. Sodium: 889 milligrams. 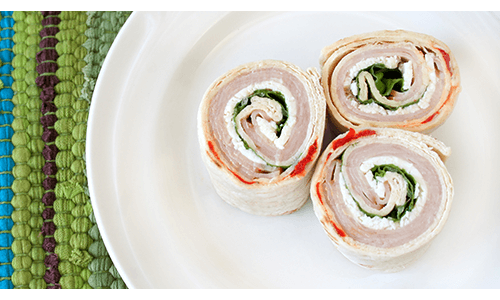 These pinwheels are perfect for throwing into a packed lunch. Add a skewer of veggies or fruit for a nice side snack. 1. To prepare the dilly Dijon spread, combine first 6 ingredients in a bowl, stirring with a whisk. To prepare the pinwheels, spread half of Dijon spread over flatbread. Top with turkey, cheese and spinach. 2. Starting with the short edge, roll up topped flatbread, jelly-roll style. Cut crosswise into 4 (1-inch) pinwheels. Serve with red bell pepper slices and carrot sticks, if desired. Serves: 1. Calories: 267. Fat: 14.4 grams. Saturated fat: 3.8 grams. Protein: 20 grams. Carbohydrates: 20 grams. Fiber: 8 grams. Cholesterol: 35 milligrams. Sodium: 723 milligrams. 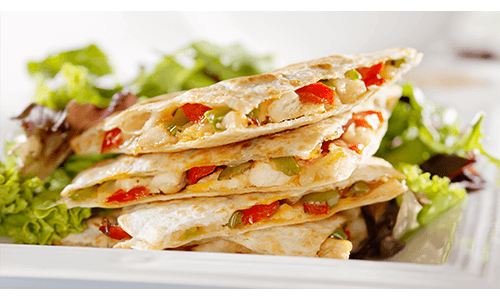 Quesadillas don’t have to be piping hot to be a tasty treat. Use whole-wheat tortillas for a healthier option. 1. In a small bowl, combine chicken, cheese, cumin — and jalapeño, if desired. 2. Warm a medium skillet over medium heat. Spread chicken mixture over 1 tortilla and top with the other, pressing down with a spatula. 3. Cook until golden brown and crispy, about 4 minutes. Carefully flip and cook 3 to 4 minutes longer. Let cool completely before packing to keep it from getting soggy. 4. Cut into six wedges; send along with a small container of salsa. Serves: 1. Calories: 601. Fat: 27 grams. Saturated fat: 15 grams. Protein: 45 grams. Carbohydrates: 49 grams. Fiber: 9 grams. Cholesterol: 119 milligrams. Sodium: 1052 milligrams.